When Matthew Wood, supervising sound editor for Skywalker Sound, needed a portable ADR (automated dialog replacement) unit for the recent Star Wars movie, he had to invent it himself. Normally, ADR work is confined to the studio. For "Star Wars Episode I: The Phantom Menace," Wood wanted something portable. But it was vital that Digidesign's Pro Tools be the focus of whatever he designed. So Wood came up with the idea of developing a portable Pro Tools-based ADR unit. "Because of my interest in Pro Tools, I wanted to have something that would allow me to do it all within Pro Tools software," Wood says. But first, technology had to catch up with his idea. "I was waiting for a PowerBook that would display a large image using millions of colors," Wood says. "Then the WallStreet (Apple G3 PowerBook) came out and at the same time, Magma was making a new expansion chasis. I got a Miro DC30 Plus and (a Digidesign) Audiomedia III card and was able to generate video off of the eight-gig internal drive and record the audio to a four-gig expansion drive." To get some extra help, Wood turned to Digidesign development partner Gallery Software. Mark Gilbert, Gallery's director of product development, integrated the company's ADRStudio software into the rig Wood developed. "Mark's ADRStudio drove the sessions," Wood says. "There's no way I could have done this without the ADRStudio." While Digidesign has not tested this configuration, Magma has shown that it seems to work effectively. To make sure that it would work properly, Wood had to test it first. "I demoed it for George (Lucas) and it worked the first time so he gave me the okay to use it for the rest of the movie," Wood says. "We used it the first time for a session in London and had a backup system in case anything went wrong. But nothing went wrong." Quite the opposite actually. Using the hybrid system, Wood was able to quickly record an estimated 1,500 lines of dialog. Because the whole thing was portable, he was able to take it wherever the actors were. Gilbert adds that this not only saved time, but saved money too. "The idea was to take this solution anywhere, including on the set," Gilbert says. "This saved a lot of time and money in the post-production process. And that portability, that's something that has been kind of a Holy Grail of ADR recording up until now." 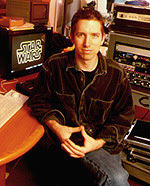 Skywalker Sound was already editing the film's audio on TDM-based Pro Tools systems, so integrating the ADR into the main mix was a simple process. "Because everyone is on Pro Tools, it made it very easy," Wood says. "Plus the sheer amount of third-party development Pro Tools has for the Mac - using Gallery and Synchro Arts' VocAlign and having AppleScript. And because the picture department was all on Avid systems, we were able to easily share files back and forth. "It made the turnaround time extremely fast," Wood adds. "I'd send the Pro Tools sessions over the Internet or FedEx them and they'd process it all there (at Skywalker). They were able to access the files so quickly - without the need for DAT or re-labeling or OMF transfers." It also eliminated two major problems associated with ADR recording - availability of the actors and the fact that the actor has to go to multiple studios. "When you go into those studios you run into technical problems," Wood says. "They may say 'oh, we're using ADATs' or 'we're only using two-inch tape.' Then you have different recorders and mics. This setup allowed us to have much more control over the process." It worked so well, Wood expects the same system to be used on the next Star Wars movie. "We're going to use the same setup for Episode II - that's the plan anyway," he says. "Because pretty soon the facility is going to be all Pro Tools."